The weather has improved, so I’ve been spending more time in the garden. Every time I am there, I am caught somewhere between panic at how much work there is to be done and excitement that the new growing season is beginning. Everything seems to be waking up. 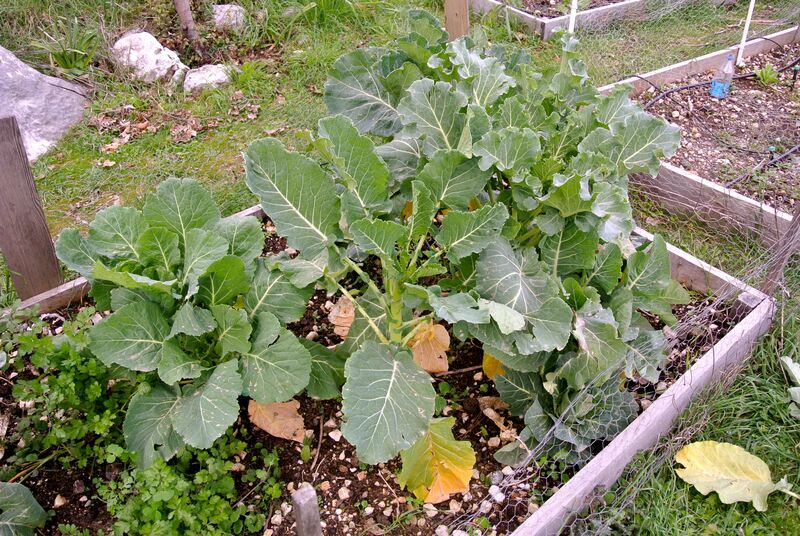 I had planted a lot of brassicas in the fall, imagining that we might eat some over winter. We did eat some bok choy and kale, but the heading and flowering folks mostly just overwintered in a stately but not very exciting fashion. Now that the weather is warmer, though, things are picking up, particularly among the cauliflowers. All leaf. They grow enormous, but it’s all show. In that thicket of cauliflower, there is just one little tennis ball of a flower. I don’t know what it is — I am lousy at growing them. But the purple one is turning out nicely, and there are a few green ones coming in another bed. If I were a more diligent gardener, who wrote everything down, I could probably figure out what I accidentally did right to those few plants, but I haven’t a clue. 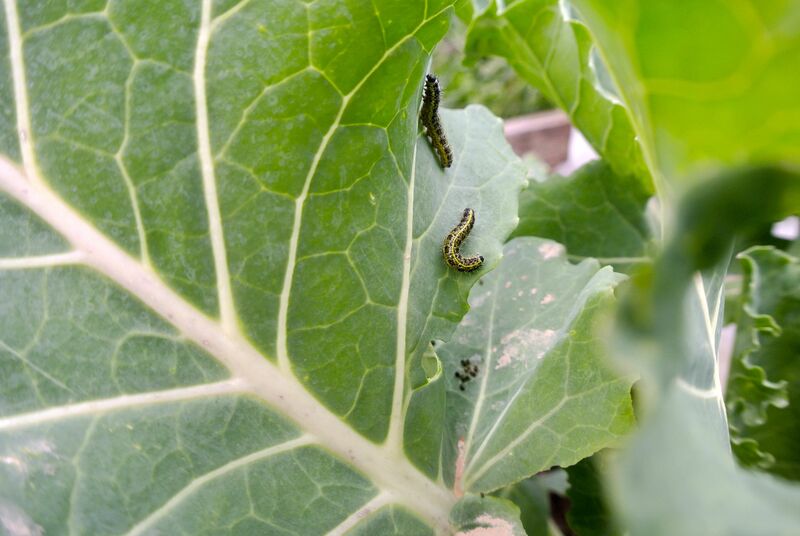 My fingers were bright green with caterpillar gore by the time I got through inspecting all of the cabbages and their ilk. And you can’t help but notice that the caterpillar remains smell cabbagey, which is kind of sad. A Roma tomato is born. Welcome to the family! I’m sure there will be more- but I’ll find them! 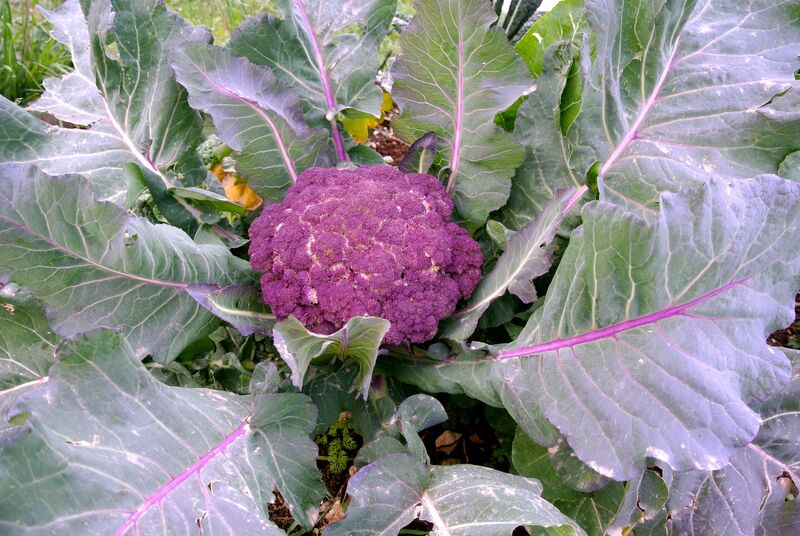 I love purple veggies too, I grew a purple cauli one year too, note the singular! Have you tried purple carrots yet? Oh they are definitely on the list. My carrots often split due to rocks in the soil but they still taste good. I love all the colours that veg has. 🙂 A great bouquet. It’s great fun to try them. Actually, purple bok choy is a great favorite if mine..
You moved quickly, but it seems at the perfect time. It looks like you have had time to prepare for your spring garden. We may be moving shortly. Not the perfect time! I bought all my seeds and we be moving in early spring… Well, on the bright side, then this will give me plenty of time to prepare, and I can at least have a salad garden and a few tomatoes while I prep the rest. I know you are busy, but I will be excited to see more pictures of your new home and gardens in your future posts! And I look forward to following your exiting move. Let’s hope we find the time to write about it all. 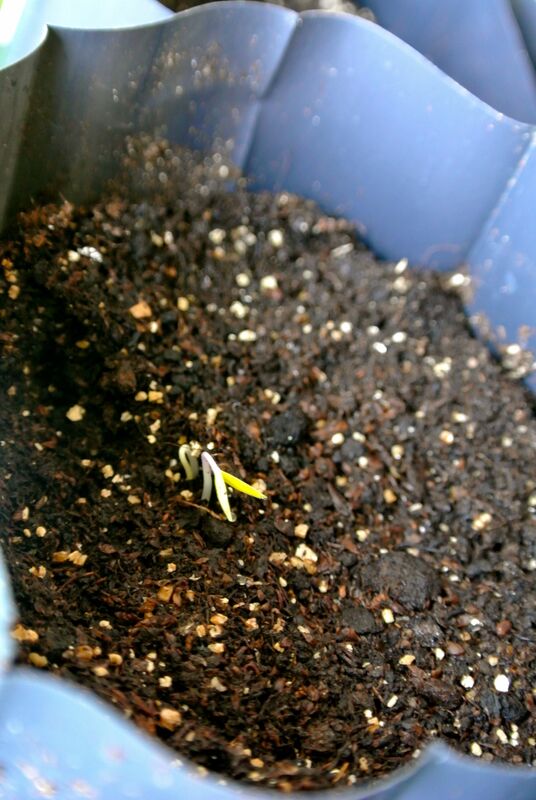 The first tomato seedling is always so exciting. It is terrific to have that lovely purple cauliflower…I know you wish you had more. I do, and I’ll keep trying them so that maybe one year I’ll have a bumper crop. And just in case they never grow for me again, at least it’s recorded. That purple cauliflower just shot up, didn’t it? Great! You know what they say about watched pots… I just had to ignore it for a spell, I guess. Your garden is moving along nicely. That purple cauliflower is something to see! Good to see you tomato seedling pushing up through the soil. Even though mine aren’t planted yet, seeing yours means mine won’t be far behind. Yay! Intrepid things, aren’t they? Lets hope we’re all buried in tomatoes this summer! All your plants are looking so healthy! I have no luck with brassicas, and have (for now) given up on them…It’s exciting to see someone have good luck with them! 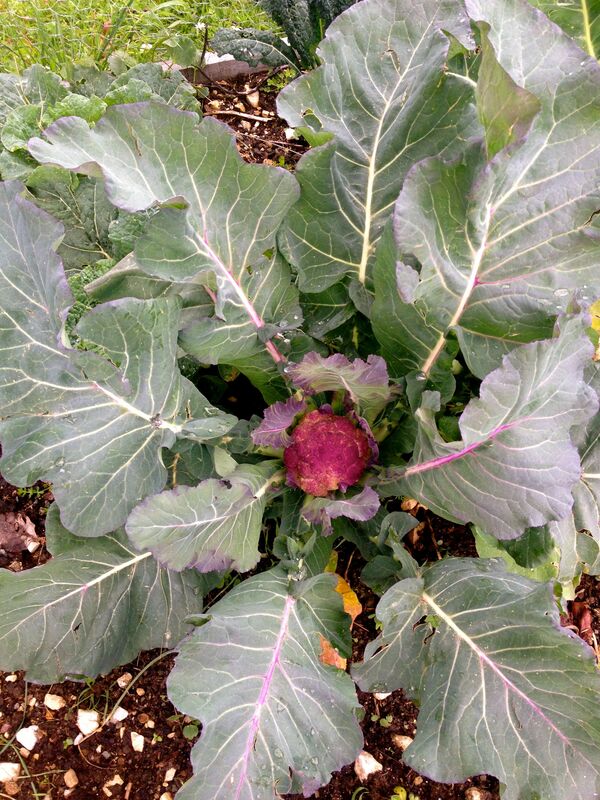 I gave up growing cauliflower, it seems to a a hit and miss thing in my garden. You purple cauliflower is gorgeous. May be I should give purple a chance. Know what you mean between panic and excitement at the start of the new garden season. I was ready to throw in the towel until this year. Now I’ve tasted how sweet they are, I’ll probably keep trying a few every year. Ha ha! Not for long- come summer everything will begin to swoon. It’s so crazy that all those leaves taking up all that real estate only produces one head of cauliflower! Seems like a waste somehow . . . But that is exciting about the Roma tomato. Any brothers and sisters by now?